Imagine a shade that is a hybrid of fabric shades and horizontal blinds. Presenting the perfect blend of both: Layered Shades. It’s flexibility and light control at your fingertips. A design as unique and innovative as you are – stylish and stunning. 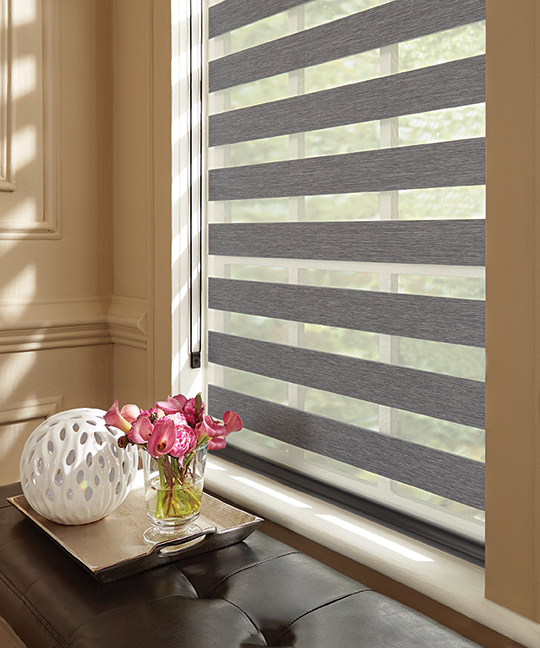 Layered shades are designed as a roller shade with two closely-linked layers of fabric with unified stripes of sheer fabrics combined with tightly woven bands of color. The sheer fabric helps protect your furniture and floors from the sun’s damaging UV rays, while the bold, wide stripes of color create a unique look for your room with the punch of clean, horizontal lines. There are no seams or cords to disrupt the look, and these beautiful shades disappear completely into a matching fabric-wrapped cassette valance. Whether you’re looking for a neutral hue for a classic look, or the boldness of weaves or shiny metallics, layered shades provide the perfect modern look for your room.